Hey, it’s fall! Football is on! Hockey is on! Playoff baseball is on! 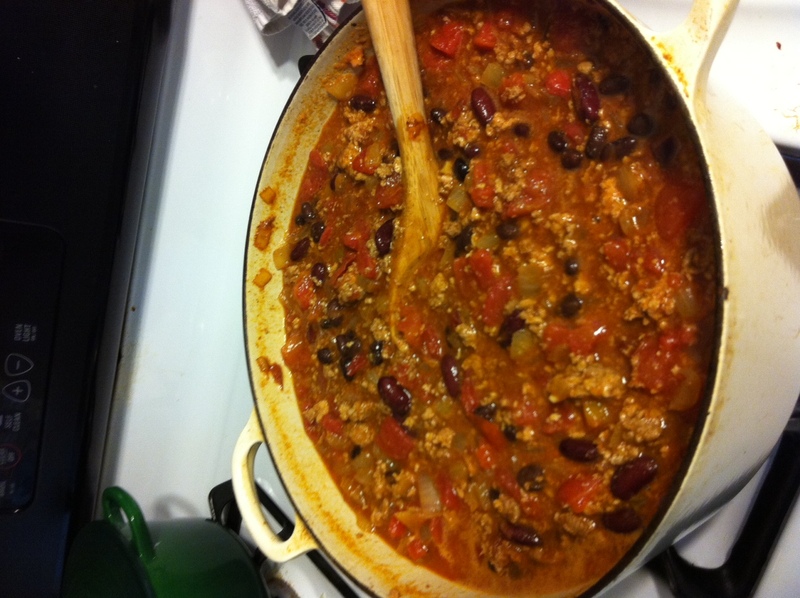 Men are glued to the television and that means if you make chili you can eat it all yourself! I’ve been making this Martha Stewart Everyday Food chili for several years because I think it has tasty, interesting flavors and is pretty quick. It bills itself as 30-minute chili but that’s not realistic. As is the case with many Everyday Food recipes, the cooking time and directions for certain steps are way off. But no fear, cooks! It can easily be tweaked for your personal preferences. Toppings! Cheddar, avocado, sour cream, tortilla chips, etc. Heat the oil over medium heat and add the onions, salt and pepper. Cook, stirring occasionally, until they are soft and not so onion-y, about 10 minutes. Add the garlic and stir around for another minute. COOK’S TIP! Very often recipes will tell you to cook garlic and onion (or other veggies) together from the start. This is a big mistake. Garlic cooks in about a minute and if it’s being sauteed, burns pretty soon after. Always add it at the end of sauteeing and cook for just a minute. Add the tomato paste, chili powder, cinnamon, and chipotle chiles. It’s really important that you get the right chiles because the adobo sauce is the main flavor in the chili. If you want to cut out some of the heat, scrape out the seeds from the chiles before you chop them. Stir it up and cook this big sticky mess for 2-3 minutes. Add the beef and turkey and stir with the mixture for 5-10 minutes until the meat is cooked. It’s kind of a pain to cook all that meat with the onions and seasoning so in the future I might try cooking the meat in another pan first. Just a thought. Add the diced tomatoes, beans (rinsed and drained), and beer. Bring to a boil then lower the heat and simmer for ten minutes. Enjoy! Chilli is the ultimate warming dish. You might like my recent veggie chilli recipe – it was yum.